GRAND JUNCTION, CO USA ― March 2018 ― New cost-effective, automated Conformal Coating System (SimpleCoat TR) with tilt and rotate capability and excellent repeatability for just under $48,000 offered by GPD Global. SimpleCoat TR is a NEW low cost, inline, simple Conformal Coating System with full-featured programming making the conformal coating processes quick and easy to set up. 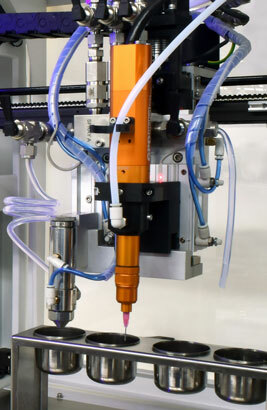 This well-rounded performer is ideal for selective conformal coating and dispensing applications that require a high level of accuracy and repeatability. SimpleCoat TR works with a customer-supplied laptop computer. 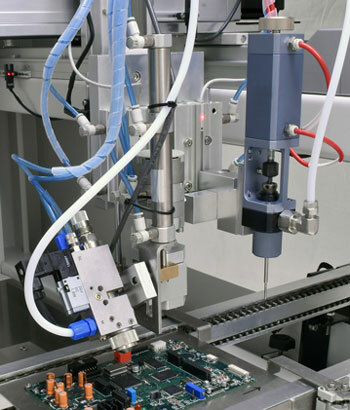 Programming of this conformal coating system is easy and can be done either by manually teaching a program or by using a JPG image. All dispense and motion parameters can be easily altered with the easy-to-use interface. Various shapes, patterns, and areas can also be programmed. A Tilt and Rotate valve is included in the base configuration along with the robust 3-axis motion platform. Station 1 can tilt ±45° and rotate ±90° giving you full access to all sides of your device. To further enhance the dispense capability; an optional volumetric pump may be used in place of the needle valve. See SimpleCoat basic model for conformal coating without tilt and rotate for just under $40,000!